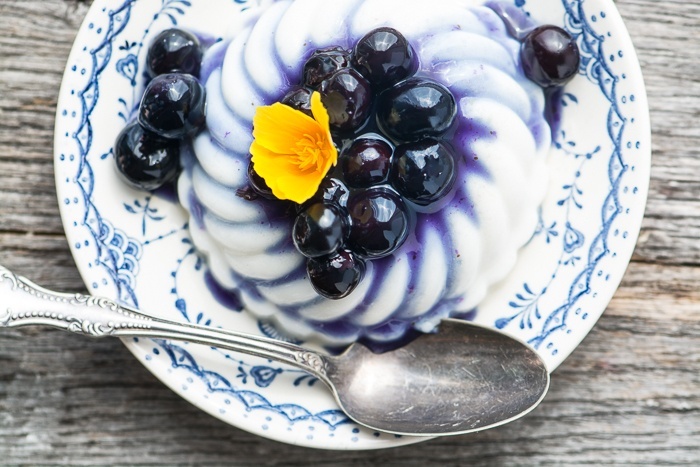 Vegan Coconut Panna Cotta with Blueberry Sauce is a light and refreshing way to end a meal, the texture is like silk! If you are using metal molds, spray them lightly with cooking spray and wipe out the extra. If you are using silicone molds, no prep is necessary. You can also use small bowls or glasses. Heat the coconut milk and sugar in a small saucepan until it comes to a simmer, stirring to dissolve the sugar. Meanwhile put 1/4 cup water in a small bowl and sprinkle with the gelatin. Let sit for 5 minutes, then stir. Take the coconut milk off the heat and whisk in the gelatin, stir until the gelatin is completely dissolved. Stir in the vanilla. Strain through a mesh strainer into a measuring cup with a pour spout. Fill each of your molds to the brim. Refrigerate until firm, 2-3 hours. To make the sauce, put the blueberries, sugar, and 3 tablespoons of water into a small saucepan and bring to a simmer, stirring constantly. Dissolve the cornstarch in a little cold water and stir until smooth. Add to the hot sauce, stirring to blend well. Continue cooking for a few minutes until the sauce thickens. if it gets too thick, add a bit more water. Set aside to cool. To un-mold the panna cotta, gently loosen it from the edges of the mold with your fingers, it should pull away easily. Invert on a serving plate. If it doesn't come out easily, dip the mold in a little warm water for a few seconds first, then invert. Serve the panna cotta chilled, with the fruit sauce.